If you're looking for a full service translation agency that can take care of all your translation & interpretation needs, you've come to the right place. AllTranslation.net is the best translation company providing the widest variety of services. No matter how big or small, complex or simple your translation project, AllTranslation.net can give you the best quality, the fastest delivery time and the lowest price. 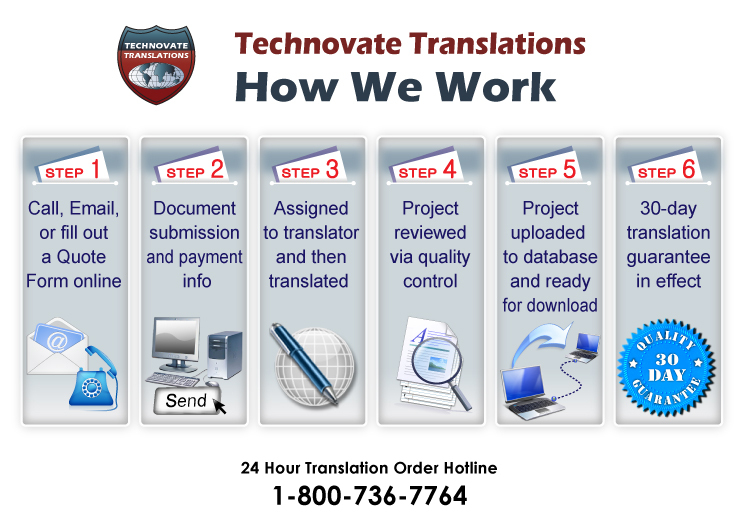 High quality document translation is just the beginning of the translation services we provide at AllTranslation.net. Because we work with over 3,000 highly talented translators from a wide variety of professional and academic backgrounds, we can translate documents for virtually any industry, no matter how complex, in over 150 languages. Whatever the content and language of your document, we have the right translator for you, and we can start your project right away. We provide a wide range of translation services, and have the capacity to handle large, multi-language projects as well as small, single-document translation jobs. No matter what, we guarantee on-time or early delivery of the finished product. Call us for a free quote toll-free. We're open 24-hours!